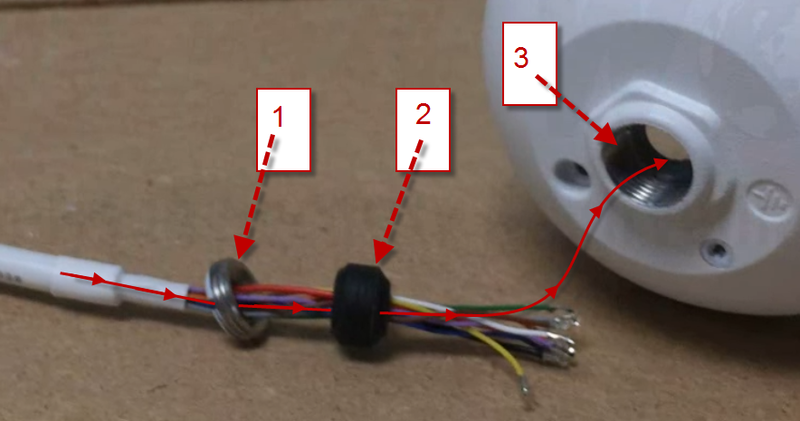 This guide will show you how to replace the pigtail on a Dome IP Camera. Damaging the pigtail can be pretty frustrating. When you purchased your IP camera you wanted a good quality product, and you spent $100 or more on it. Generally, these issues come from installation mishaps, not sealing the RJ-45 connector at the end of the pigtail and leaving it exposed to the elements, or falling victim to vandals. The out of pocket expense to replace the camera can be pretty pricey. Luckily, we have a solution for you. It involves some work on your end and a little bit of time, but potentially saving hundreds of dollars by replacing a part vs. the whole camera is something that we think most people can get on board with. If you have any questions about the procedure, you can comment using the discussion box at the bottom of the page. *We dremelled ours to create a gap for the pigtail to fit in, while keeping the edges intact to make contact with the locking nut. Replacing the pigtail on a dome IP security camera from CCTV Camera World on Vimeo. The housing, position of screws, and mounting orientation will most likely be different on another camera. You'll have to locate the screws on the outside of the IP camera. Different housings have different locations. You'll have to identify them and remove the screws. Use the hex key that came with your camera. If you don't have one try matching a Torx bit. We used a 5/64 bit, but the screws across all of our IP cameras are not uniform in size. After you've opened the IP camera, you'll have to expose the portion where the camera pigtail is connected to the CMOS Image Board. There is no standardized board where all the components are neatly placed in the same location every time. It varies from camera to camera. On the camera in this tutorial, the pigtail was under the plate that contains the image sensor. Great! You've disassembled the IP camera and have located the 10 pin connector for its pigtail. Since the pigtail is bad you can snip the line. Make sure to leave enough room to grab onto the cabling and remove the connector. Pull the connector out as straight as possible to make sure you don't damage the pins. The connections will expand and contract due to heat. A simple trick to loosen them is to slightly rock the connector left and right. Use the specialized screwdriver to unscrew the locking nut from the back of the camera, and remove the entire pigtail. It is a good idea to set aside the 10 pin connector in a safe and organized space in case you needed it in the future. Before you thread the new pigtail in to the camera you need to remove the Molex connector from the end. 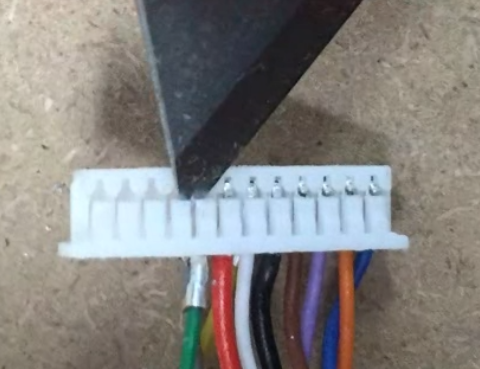 Use a razor blade to remove the Molex connector from the wires by carefully lifting the lever and pulling the wires out one by one. You don't want to lift too much as the lever may not lock the wire in place again due to being warped. Thread the pigtail through the locking nut first, then the grommet, lastly in to the housing. When fitting the pigtail in, make sure the heat-shrink jacket is inserted at least 3/4 of the way into the cameras housing. Secure the pigtail within the housing by using the specialized screwdriver on the locking nut. It's important that it's locked in place now because the pigtail will rotate as you turn, and if its fixed in place the wires could come dislodged and you will have to re-open the camera and attach the wires again. Attach the Molex connector you removed from the camera's new pigtail using the pinout below. If the levers are too loose, bend them forward slightly to get them to retain their shape in a position that will put enough tension on the raised button to hold it in place. Be cautious not to cut yourself if you're using a razor like we did. Once all of the pins are in, use Loctite threadlocker to secure the wires in place. The fluid is non-conductive and won't create crosstalk or short the lines, but it will help to hold them in place. Blow into the top of the connector to remove any excess liquid from the pin holes, then plug the end into its home on the CMOS Image Board to prevent clogging. Allow the Loctite to polymerize for at least one hour. It takes 24 hours to fully cure. So, the thread sealer is dry and the 10 pin connector is attached to the board. It's time to reassemble the camera. Essentially you'll be working backward from disassembling the camera. When the ping results begin to return data stop the continuous ping by closing the window, then go to its address using IE11. If you need help setting up ActiveX controls to view the web service you can follow this guide here. Once you can log in and find the camera to be operational, you can mount it back in its place and tie it into your NVR again. The pinout is the same across almost all of our IP cameras. You can find the pigtail we used on our site for $35. If you are unsure whether or not the pigtails pinout will match your camera you purchased from us, leave a comment below in the discussion box. Is everything plugged in? You should check. Cup your hand over the lens to block out any light and listen for the click as the IR board comes on. If it does skip to 2-1. Since the IR did not click on, test the power source with another camera. If the other camera powers on skip to 3-1. If you don't have another camera continue to 1-4. Use a different port on the PoE switch, or use a different 12vDC adaptor. The output should be 12V DC 1amp. If it still won't power on skip to 3-1. You can use the IP Config Tool that came with the camera on the mini disc or if you don't have the disc you can find it in our downloads section. Use the software to locate the camera on the network. Change it's IP address to match the scope of your network, but outside of the DHCP range to avoid an IP conflict. For assistance in changing the IP address of the camera using the IP Config Tool follow this guide here. With a changed IP address that matches the scope of your network, you should be able to access it via the web service (at its IP address through the IE11 web browser). Disassemble the camera again, and check to make sure everything is plugged in. This includes any ribbons or cables that run from one part to another. Take a look a the pigtails 10 pin connector. Did you apply too much thread sealer? Is it insulating the pins and wires from a good electrical connection? Are any of the wires out of place? They may have moved out of the connector when you plugged it in. Did you scratch the board with a screwdriver or break off a capacitor? Does any of the solder points look burned? If so you probably have a very expensive paperweight now. Open it up, get your nose in there and take a whiff. There is a distinct smell if you fry your board. The best way to describe it is burning electronics. If it does you can stop right there. It's time to get a new camera. Please use the discussion box below for any questions about this article, or security camera repair.